I used to do WHAT?! Once upon a time, I would be up early every morning and out of the house by around 8am. I would spend an 8 hour day working hard – usually not very physically active, but mentally focussed. I wouldn’t be home until perhaps 6pm, and then there was cooking to be done and housework and maintaining a relationship. And that was my day. Looking back, that seems such a long day! Such a long time to be out and active and doing things. I never gave it a second thought then, but now I find that a mere 3 hours out and about with a toddler and a pregnancy has me exhausted! Elspeth and I left the house around 10.30 this morning. I thought I’d take her to Child’s Play again, to get her nicely exhausted so that she would stay happily in her pram while I did the shopping. 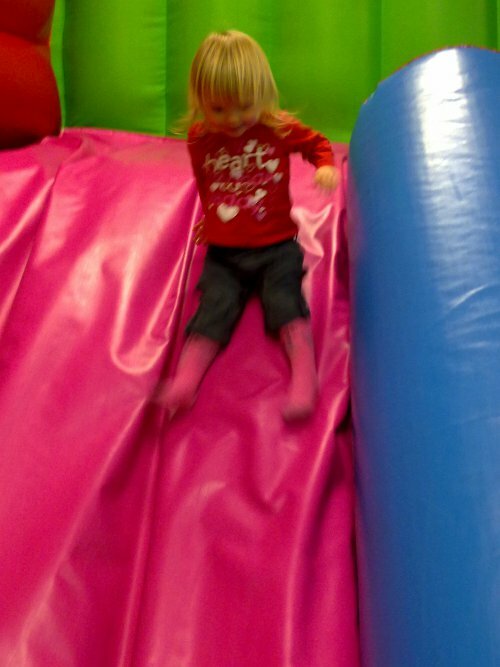 Well, for starters, going on the jumping castle with her was seriously exhausting! I don’t remember the last time I went on one, but I’m sure it wasn’t that difficult. I kept going to sit down – the wonderful thing about Child’s Play is that the layout means you can see the whole place from the tables, meaning you can sit and sip tea while still watching your munchkin play. However every few minutes Elspeth would realise I wasn’t with her, so she would come and take my hand and say “Mummy play too!” and we were off again! After an hour of this, I decided it was time to go – we had shopping to do, after all. Leaving prompted a minor tantrum, but that was easily dealt with. But then when we got to the Plaza, despite her obvious tiredness, she was still begging to get out of the pram and walk! Needless to say, that idea was firmly quashed, and she stayed up. Darned if I was going to be chasing her around all day! So we came home after the shopping, and I thought maybe it would be nap time. How could she not be sleepy? But instead, she wanted to go “out the back” and play some more! So we spent an hour or so running around out there. It’s 3pm now and I’m wrecked. She’s still going strong, though! I seriously have no idea how I used to manage eight hour work days, plus transit time, and then do everything else on top of that! And I seriously seriously have no idea how I’m ever going to go back to work any time after Evelyn is born! Aidan should be home soon, hopefully he’s a little less buggered than me, and I can handball this little bundle of energy to him! 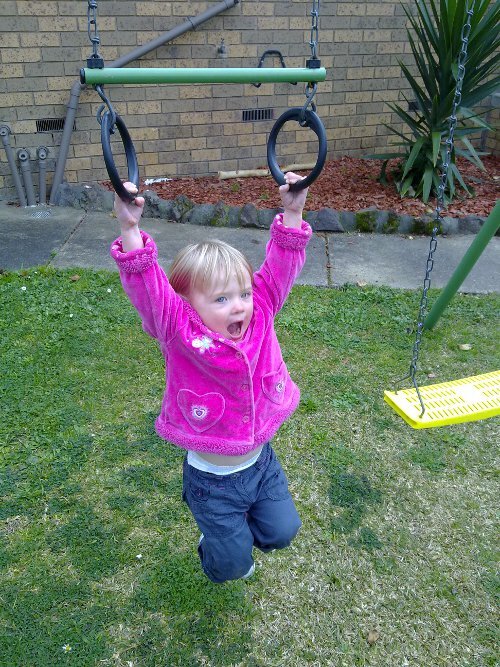 This entry was posted in Family and tagged children, children's activities, elspeth, pregnancy.